3D In Your Face is one of greatest 80’s hair metal tribute bands. “Midnight Devil” s is the last work of this band, released in late 2013. The album is loaded with great Hair Metal highly influenced by the '80s but with a contemporary style of the Rock or Metal of this millennium. The first two songs "Forbidden City" and "Generation Durt" are amazing, because they catch you and you want to hear more of 3D In Your Face. They are songs with catchy choruses and great guitar solos. Another point to note on this album is the song "Always Brings Me Back" because it is usually different from the others, but is a great Hair Metal Ballad. 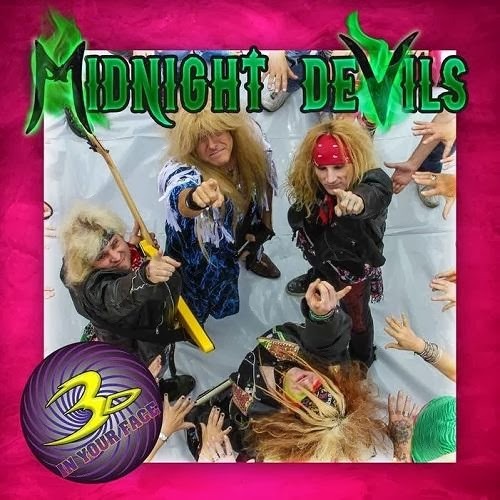 In summary "Midnight Devils" is a nice album to listen, that any fan of the eighties and the Hair Metal will enjoy the most. I personally think the band could improve aside from being a cover band and try to find a more unique sound. However, this work Rock, but it could be better. They have a lot of potential. The Best Hair/Glam Metal Songs!